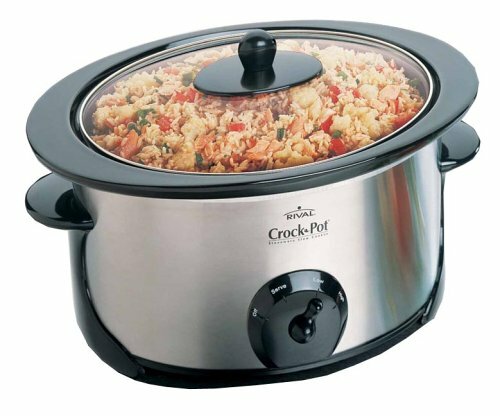 Americans call them ‘crock pot’s’, we British know them to be ‘slow cookers’. Who cares about a few such differences when the object does the same thing in both countries? I have just christened (okay, that’s a very non catholic statement… I should probably use the word, ‘baptised’) the slow cooker. I’ve had it for 6 weeks and haven’t had a day yet where I have been well enough prepared to use it! Today I was home and thought I’d give it a go, a hotch potch of veggies and chicken thighs resulted 5 hours later with a sumptuous chicken casserole…all that was missing were the yorkshire puddings (otherwise known as ‘batter puddings’), but within 5 minutes they were done too and we all sat down to a scrummy meal that had taken next to no effort to prepare. Elena recently came up with a great way of accumulating more stock pot recipes; by paying a minimal fee you can have access to more than 200 downloadable recipes. Now that’s frugal living, if ever I heard of it! 11 Responses to What a crock! My favorite slow cooker recipe is Chili. Cut of some onion and green (or whatever colour you like) peppers, and put them at the bottom of the pot. Brown some ground beef, and set it aside for a moment. mix the ground beef into the bowl of sauce, and then pour it into the slow cooker. 8-10 hours on low 4-6 hours on high. Stir before you serve to mix the onions and peppers in. You have the most scrumptious looking food on your site! I’ve used a crock pot since I got married over 30 years ago – in fact, I received 7 of them for wedding presents! I use it for soups like chicken noodle and beef barley, spaghetti sauce, etc. It’s so nice to get home to dinner which is ready to eat! Kid’s Mom, I have you beat! I received eight for wedding gifts. How I wish I’d kept a few more than I did. My favorite recipe is beef and noodles. Cook on high for 5 hours, or until meat is done and soup is bubbly. When cooked, remove from crock and cut up in small, bite-sized pieces. Return to crock. On stovetop, cook No Yolk Egg Noodles until tender. I use a whole bag. When done, add noodles to crock and stir into the meat. I love my crock-pot. I’ve had this one for 20+ years now, it’s #3. 2 cups or so (could be more) of already cooked rice (leftovers – I make extra just to do this) 1 or 2 eggs, a tall can evaporated (not sweetened condensed!) milk (that’s about 1/12 cups) or if you don’t like the idea of canned milk, scald and cool regular milk. Canned is better because it won’t clump up and get yukky (that’s why you scald the regular stuff). Sugar – anywhere from 1/4 to 3/4 cup (depends on how much rice, you know). Raisins or other dried fruit optional. Cinnamon and vanilla if desired, more or less to ‘taste’ (I put in a glug of vanilla and a shake or two of cinammon). 1/4 cup butter – butter the crock pot with some of it, then dump in the other stuff and stir really well and dump the rest of the butter in the middle. Cook on low for at least 6 hours, stir once if you remember to. You can also do it overnight but it will often end up a little overcooked with some crusty caramelized stuff on the bottom of the pot. When we do it overnight it’s a hot breakfast! I have tons of other recipes, too. tell me are crock pots easy to clean? 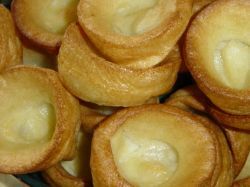 You must tell me how to do yorkshire puds in the slow cooker! I would never have thought of cooking them there.. don’t they need a high heat to cook? that Chilli sounds really scrummy, I’m going to try that, I have some mince in the freezer, only thing is that I only use pork mince, because I don’t enjoy beef mince as much, I’ve used it in chilli before and it works okay, so hopefully it’ll be okay in the crockpot too 🙂 Thanks for the recipe! Jean, thanks, food is never far from my heart, mouth or stomach! Valerie, chicken noodle soup sounds really good, I wish I had some chicken defrosted, I think that’d do my daughter good today, she has such a heavy cold! Lisa, I would never have thought of doing beef and noodles in a crockpot, that sounds very interesting! How large is a ‘large can’, I know Americans do all that supersize stuff, I don’t want to use an insignificant, inferior British can! Fancy receiving 8 for wedding gifts! I bought one second hand from a car boot sale many moons ago, it had no instructions and I considered waiting for a maximimum of 2 hours ‘slooooooooowcoooooooooooking’, so when everything was still raw after a couple of hours, I poured the lot into a dish and shoved it all in the oven! I love home cooked rice pudding! (my mums is delish) Thanks so much for that, I’d never thought of it as a breakfast, but I think I’m going to try it because I hate eating breakfast, and this just might tempt me! Anytime you want to throw a few more recipes my way, feel free to do so! I wish I’d have thought of that, but I’m sorry to say that I didn’t and I cooked them in the oven 😉 We did have dumplings in a casserole that Mum made the other day though, Dad helped because we were at church when the dumplings neede to be added to the mix, so he used a bought dumpling ready mix, made them up, put them in the stock pot about 40 minutes before the end of cooking time. They were absolutely delicious! Absolutely! I have been very suprised by how easy they are to clean, I suppose a lot depends upon how often you stir the meal inside it though, because apparantly, every time you take the lid off the crockpot, you add half an hour on to your cooking time. also, you have to keep an eye on the liquid content and make sure that there is ebnough, but not too much!